Createspace Independent Publishing Platform, 9781453678879, 542pp. Ninety-nine percent of the time the world spins like a top, the skies are clear, and your refrigerator is full of milk and cheese. But know with certainty that the world is a dangerous place. Storms rage, fires burn, and diseases spread. No one is ever completely safe. Not you. Not your children. We all live as part of a very complex ecosystem that is unpredictable and willing to kill us without remorse or pause. 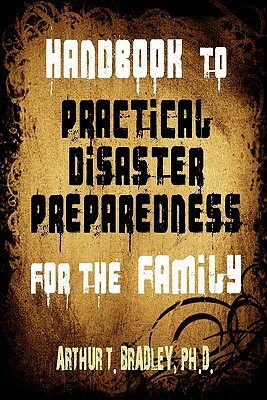 This book will help you to establish a practical disaster preparedness plan for your entire family, covering all 14 basic human needs. Additional information is also presented for those with special needs, including the elderly, children, people with disabilities, pregnant women, and pets. Every topic is well researched, with over 240 references cited, and is presented in a clear, easy to read format. Dr. Arthur Bradley holds a doctorate in engineering from Auburn University and currently works for NASA. Having lived all across the United States, he writes from personal experience about preparing for a wide variety of disasters, including earthquakes, tornadoes, hurricanes, floods, house fires, massive snowstorms, electromagnetic pulse attacks, and solar storms. He has been featured in the New York Times, Money magazine, the Toronto Sun, and numerous radio shows. Dr Bradley subscribes to the philosophy that preparedness should always be motivated by love and concern, never by fear and paranoia. His practical approach to family preparedness has received widespread praise from individuals, emergency preparedness groups, and religious organizations. He is the author of several highly acclaimed books on disaster preparedness, including the "Handbook to Practical Disaster Preparedness for the Family," "Disaster Preparedness for EMP Attacks and Solar Storms," and the "Prepper's Instruction Manual." He conducts free seminars around the world, teaching individuals and families how to establish effective disaster preparedness plans.